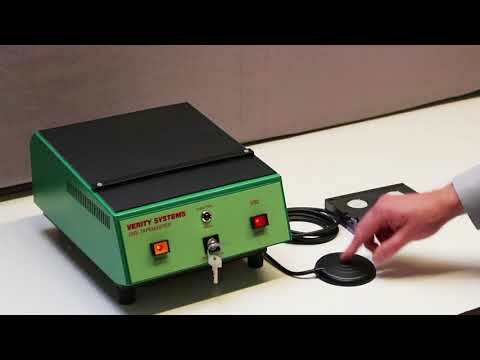 The Verity V92 Degausser is the most compact, high energy eraser available. Capable of erasing all high energy magnetic media, oxide or metal based including broadcast, video, data & diskettes. The V92 Tapemaster DLT Degausser is a powerful, inexpensive high energy eraser available for users who require an efficient and powerful multiple media degausser. For its size, the V92 has a very high gauss rating of 4,000 gauss and erases all LTO tape, as well as DVC Pro, 4 mm and 8 mm, Hi 8, QIC-DC 600, 2000, TK50, 70, 85, DLT, 3480/3490E/3590E, 4mm/8mm /Exabyte/Travan. The V92 Digi Tapemaster manual degausser provides a truly universal, desk-top, magnetic media degauss facility that meets the needs of a diverse range of user groups using a wide range of audio, video and computer tapes, and cassettes. Includes a 3 year 'Return to base' warranty as standard which can be extended to 5 years.